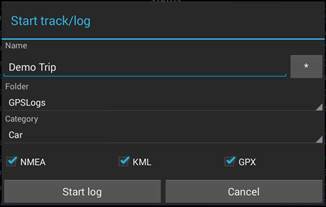 After you have given your log the desired name, press to begin recording. The button at the top of the Main screen changes to while UGL is logging your track. Walk or drive somewhere to generate an interesting track and then press to end the log. While logging or after you have stopped, you can press at the top of the Main screen. The Tracks screen appears (as shown on the right) listing all the recorded tracks – in this case, there is only the Demo_Trip log recorded above. Under Demo_Trip you will find information about the Demo_Trip log, such as the file sizes, the distance traveled, and other information which will be covered in the more detailed sections to follow. For now, press the Demo_Trip area and the Track Action menu appears. For this quick start, we are only going to View the track. However, as will be explained in more detail below, this is where you can send it, move it, open it, delete it, or rename it. Click on View, and the Map window will appear showing the recorded track. 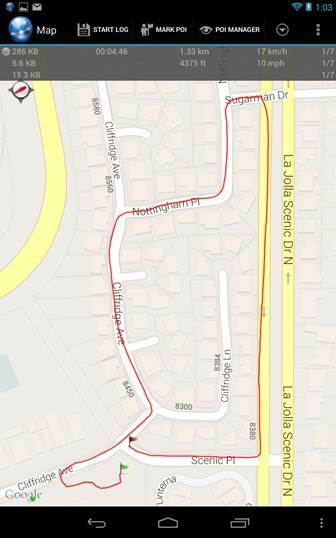 Your track can be shown online using Google Maps, Bing Maps, or Open Street Maps (OSM). If offline, you can use Mapsforge maps (which are based on OSM maps) that you previously downloaded. The track starts at the green flag and moves in a clockwise loop to the final flag where logging was stopped. To view the track in Google Earth (you must have Google Earth installed on your device for this), from the Map display, tap at the top left to go back to the Main Screen, then tap and then the area of Demo_Track, to re-open the Tracks menu. Tap 'Open With' and select Google Earth. UGL will launch Google Earth which will then zoom into the area of the track itself to show it. Send/Publish is where you email the track, send it to Dropbox or other cloud storage, or otherwise send the log somewhere. These and other options on the Tracks Menu will be explained in more detail below. 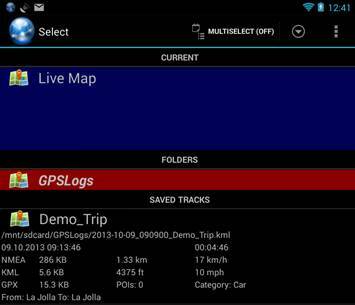 And that's it for the quick start, and that's all you really have to know to begin using UGL to record your travels and view the recorded log. In the full User Guide, each feature and option of UGL will be explained in detail, to allow you to utilize the full power of the app.